This series so far has dealt with how Bhagawan progressed in His life's mission from the playful leelas of His childhood to the divine miracles of His youth revealing His Divinity, through the reestablishment of dharma by furthering the knowledge of the Vedas and the recharging of the sacred temples. This episode will focus on the personality of Easwaramma, His earthly mother. 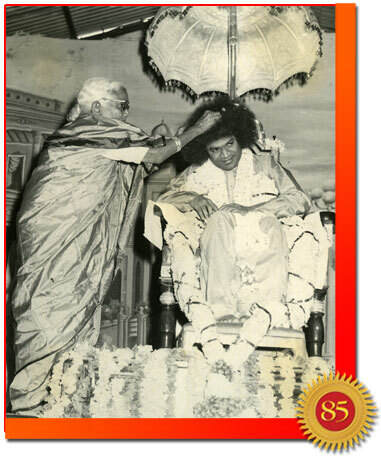 She was a pivotal force in His divine mission, as her three wishes for the betterment of Puttaparthi became Baba's focus for greater India and a model for the entire world. 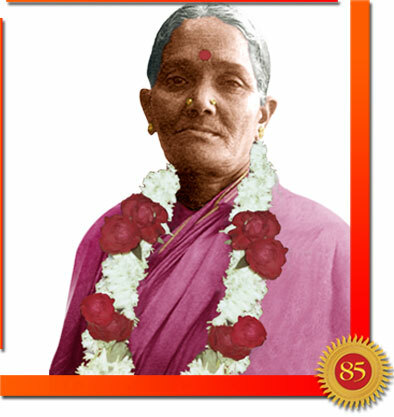 The date - 6 May - is known as Easwaramma Day. It was on that day in 1972 that the Divine Mother left the physical plane and was instantly united with the Lord. Such is the authentic consummation that every individual must strive for. 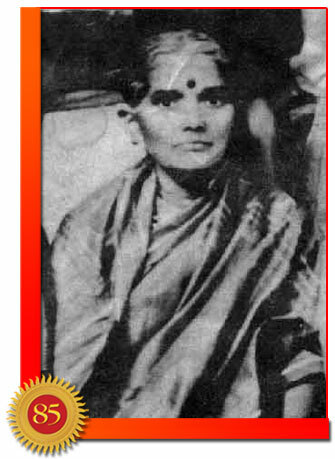 Beside Easwaramma at the time was her daughter Venkamma and her granddaughter Sailaja but she called out only for Swami. Having this yearning at the final moment is the fruit of holy purity. It is the sign of an ideal, adorable life. Such attitude must emerge of its own accord and not by means of some external force. Easwaramma is an example to learn from. Deliberating on the time of death, Arjuna was advised to think of Krishna and Krishna alone. With such focus of thought, the path to liberation ends. Baba indicates here that Mother Easwaramma, who doted on Him all her life, succeeded at the very end. Who was Mother Easwaramma that she was so able to overcome the usual obstacles to liberation at the time of death? 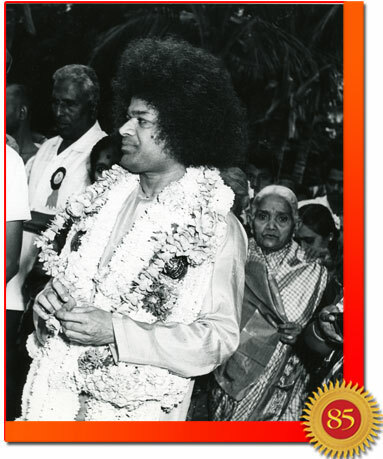 We have seen that Bhagavan was an unusual child causing surprising divine occurrences even moments after his birth. Mother Easwaramma had been confined to a simple village. Hence, these antics on the part of young Sathya would cause her alarm. As Mother Yashoda did with regard to Krishna, Mother Easwaramma would pray for Divine intervention to change her Sathya into a normal boy. Still, Easwaramma could see in Him the potential of a poet, singer, a dancer, playwright or a director, and she hoped He would blossom in these fields. In fact, Sathya's theatrical skills were so good and such was Easwaramma's simplicity that whenever she saw Him in a dramatic role in which harm or torture was suffered by His character, she wept aloud and rose from her seat to protect Him. As Yashoda, who was troubled by instances of demons vying to kill her darling child; Easwaramma also faced agonising and abnormal experiences. After every display of Sathya's supernatural powers, her worries only increased. She believed that these demonstrations would attract negative powers. Years after her death, Baba related an incident that indicates the difficulty Easwaramma had in accepting the Divinity of Bhagawan. It took place during the last visit to His grandfather, the wise Kondama Raju. Truly, Easwaramma had a heart of gold. Never was there even the slightest trace of ego in her that she was "The Divine Mother." She mingled with no reservations with everyone. She remained a simple village woman who shunned special recognition, undue attention or publicity. In the late 1960s, there were a few brick houses situated around the Mandir. One morning, a lady who lived alone in one of these structures was burning charcoal for cooking when the smoke overwhelmed her. She fell unconscious on the floor. When she did not come out by ten o'clock, some people sensed something amiss and broke open the door to find her lying unconscious. Baba merely smiled, created Vibhuti and said the pain would soon stop. The next day, she was fine. There is one legend that will always dance around Easwaramma's hallowed name. It is her inspiration for the mammoth social service projects that make the name of Sathya Sai shine throughout the world. On several occasions, Baba has recalled this endearing facet of her life. “I asked where she wanted the school to be built. She said she had a piece of land behind her house and it could be constructed there. Easwaramma was perhaps the person most gratified when Baba announced that a 12-bed hospital would be raised on the hill to the south of the Mandir. For her part, she could avail herself of the expert medical advice of Dr. Lakshmi, the famous physician and gynaecologist from Nellore who stayed for weeks in the presence of Baba. Whenever she, her daughters, or others of her family received the kind attention of that doctor, Easwaramma would request her to examine, diagnose, and prescribe medicines for other village women too. She longed for a lady doctor who could stay at the Mandir year in and year out and help women in times of dire need. When news arrived that the hospital construction had begun, she was overjoyed. Easwaramma joined the women devotees hauling sand, stone, bricks, and cement from the road up to the construction site and lifted bricks herself, brushing aside protests from the younger, stronger women. When the wards were ready, she sought out women patients, brought them to the doctor, pleaded that they be admitted, and looked after them until they could move about and take their normal share in the work at home and in the fields. The Divine Mother’s humility was no empty pose. She was very shy before the camera and argued persistently against being photographed. Many are proud that they are not proud and protest against praise but are secretly sad if it is denied. But Easwaramma was temperamentally allergic to the limelight. She was raised in a cloistered hamlet, and honoured the boundaries her forefathers set - to demarcate the fields of feminine activity. Easwarama had no desire to mislead visitors that she had special access to Bhagawan and could extract His grace for them. She was aware there were millions who deserved His grace and that she was only another candidate seeking to qualify. But when she was unable to bear the suffering of a devotee, she was compelled to go straight to Baba and plead on their behalf. If ever she took any liberty of her accessibility to Baba, it was for the sake of some distressed and disconsolate soul. In one instance, there was a couple from West Godavari who had come with a terribly sick child and had waited in Puttaparthi for a week. Due to financial constraints, they were not in a position to extend their stay. Crestfallen, the family was about to leave. As a last resort they sought out Easwaramma, and when the Mother heard their plight she took the boy by his hand and immediately led him upstairs to Baba's room and pleaded with Him to cure the child. Baba gave her a patient hearing and then calmly said, “Chustanu” meaning, “I will see.” Not satisfied with the answer, Easwaramma insisted that Baba show mercy to the poor family right then. Baba finally gave in to her prayers and healed the child. A mother's prayer never goes unfulfilled. 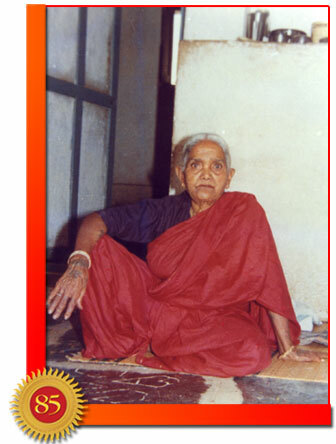 After the death of her husband Venkama Raju, Easwaramma chose to live in the Mandir at Prashanti Nilayam. 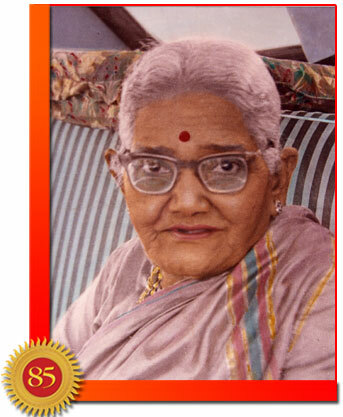 This was a boon for the devotees who benefited immensely from her comforting advice, caring counsel, and ever-helpful nature. She was accessible to all. Devotees found in her someone genuinely interested in their welfare. In those days, entire families would come to Puttaparthi and as Easwaramma interacted freely with everyone, they would confide in her their problems and worries. On one occasion, she was moved to such an extent that she brought a family of 20 members for an interview with Baba. 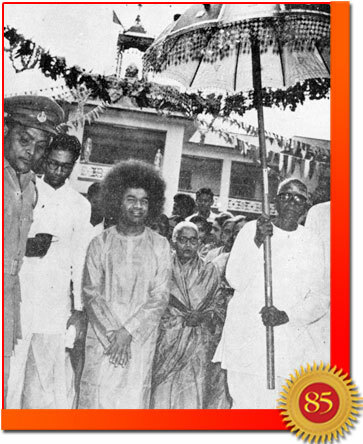 Swami graciously permitted the family to perform Padapuja to Him, the worship of the feet of the Lord with rosewater and flowers. Easwaramma had a soft heart for women who were widowed by fate and therefore ostracised by society as if their misfortune was infectious. She also sought out young women deserted by their husbands and left alone and helpless. Many such women were brought by their parents or kinsmen so that they might recover from the shock and renew their lives. She discovered that a large number of women who were brought to Puttaparthi were afflicted by 'ghosts' and these victims of dark spirits were amenable to the softness and sweetness that emanated from her heart. The love with which she treated these women blossomed as she watched Baba healing the stricken. He showered compassion on them and applied Vibhuthi on their brows. When they were restored to normalcy and returned home, Baba used to narrate the reasons why their thoughts went awry and their words soaked in spite. Listening to Him, Easwaramma decided she would not condemn or ridicule any woman on the basis of her apparent faults or failings. She knew such were but the results of persecution and poverty. The Mother thus became the primary mother to a growing number of sisters in distress. Mother Easwaramma possessed a rich spring of native wisdom, medha, with which she quenched the thirst of the desolate and deprived. She not only knew the simple remedies for physical illnesses but also employed mental strategies - gleaned from folk wisdom - that could demolish depression and remove fear from the minds of those untold numbers of devotees who came to her, cried out their heart, and poured forth their sorrows. They confided to her what they would not tell their own mothers. Her sympathy in listening unlocked the chambers of their hearts where their agony was interned. She tolerated the long narrations, never showing a hint of impatience, boredom, or judgment. That was the beauty of her goodness. Her visitors found all distress and worries drowned by divine teardrops alight in Easwaramma's eyes. She appreciated the earnestness and enthusiasm of the young. Her grandsons were a bright lot and she insisted that they join higher classes and educate themselves to the utmost. She loved to encourage the sons and grandsons of others too. She prevailed upon Baba to agree with her choice and send money to them to meet their tuition fees and the cost of books and boarding. When she found that a name had been dropped because the boy had left school, she tried to persuade the parents to keep him enrolled. Though illiterate, and coming from a simple, rural village, Easwaramma's initial request for a village school became the stimulus for the development of free education for all levels. The primary school she requested was quickly established. To immortalise her interest in the education of the village children, a high school in Puttaparthi was built at the direction of Bhagawan within two months of her death. A college came sometime thereafter, which is now an unique University. All this is in Puttaparthi and available to the village children free of charge, and similarly to all others who qualify. This model has been reproduced elsewhere with the dawn of a new philosophy of education that emphasises the building of character. Though familiar with folk remedies and their applications, Easwaramma saw value in the medical services provided by doctors and hospitals. Her request for a village hospital became the stimulus to bring free medical care to the impoverished. As she requested, a hospital was constructed and staffed under the direction of Bhagawan in Puttaparthi. In addition to a hospital available for the sick and needy, situated right on the edge of the village is a super-specialty hospital offering free tertiary care to all and sundry. This model too now has been reproduced elsewhere ushering in a redefined philosophy of medical care. During the summer months when the Chitravathi runs dry, clean, drinking water becomes unavailable. Concerned about the villagers' plight, Easwaramma requested of Baba that wells be dug to alleviate this misery. 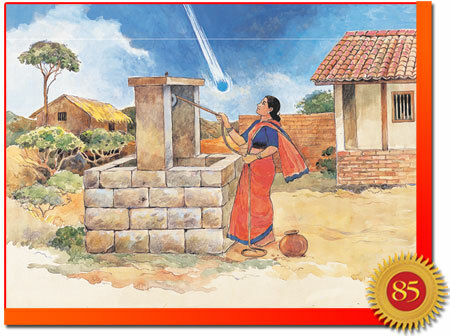 As she requested, a bore well was dug on the campus of Prashanti Nilayam that provided water all year round. But Bhagawan also promised He would bring water not only to Puttaparthi, but to all of Rayaleesema, the great arid region of Andhra Pradesh and parts of Karnataka. This mammoth project that was completed with the financing and direction of Bhagawan brought clean, drinking water to millions in the impoverished villages of the region. Later, many millions more received clean water in the metropolis of Chennai. With these projects Bhagawan implemented what even national governments found it hard to set up, demonstrating thereby what may be achieved through determination, focus, and strength of will. The three grand endeavours of offering free education, medical care, and clean drinking water to those in need were inspired by the compassion of the Divine Mother. 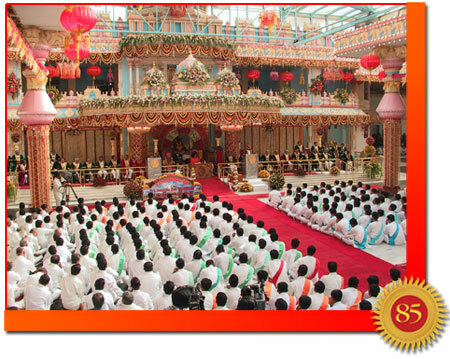 Bhagawan, whose kindness embraces all, bestowed these benefits on millions. And in doing so, He has established models for the world to emulate. We will go more into the details of these institutions in the next episodes.